If you are a diabetic, it is imperative for you to keep an eye on what you include or exclude in your everyday diet. Since diet plays a crucial role in managing diabetes, you must steer clear of foods that have a high glycaemic index, or loaded with refined sugars and trans-fats. If you are a diabetic, it is imperative for you to keep an eye on what you include or exclude in your everyday diet. Since diet plays a crucial role in managing diabetes, you must steer clear of foods that have a high glycaemic index, or loaded with refined sugars and trans-fats. In fact, you must follow a balanced diet, filled with healthy and fibrous fruits and veggies. To eat healthy, you need to start right. Health experts and nutritionists say that the first meal of the day plays an important role in determining your energy levels. Always make sure that your first meal of the day is well-balanced, meaning your breakfast must include protein-rich foods and vegetables, along with good carbohydrates (complex carbs). There are a plethora of food combinations that you can try to make your breakfast as enticing as possible, without worrying about spike in blood sugar levels. So, for times when your taste buds scream for something little more flavourful and delightful than basic oatmeal or cornflakes in breakfast, we have got you some interesting yet healthy diabetic-friendly breakfast ideas that you can make easily at home. Roasted quinoa pancake is a perfect way to start your morning on a healthy note. 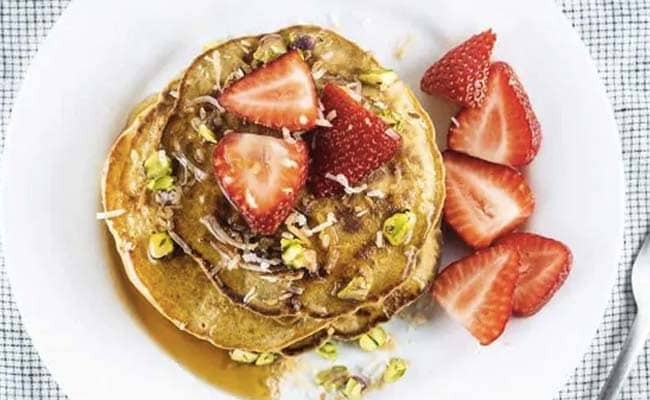 Soaked in milk, dipped in orange essence and loaded with strawberries, this breakfast recipe makes for a healthy diabetic-friendly breakfast meal. Made using whole wheat and oat flour, banana oat bread is a healthy alternative to your regular wheat bread. In this recipe, butter is replaced with olive oil and refined sugar with dark brown sugar, so that you can easily have it as your everyday breakfast bread. This yummy breakfast delight surely knows how to keep your tummy full and happy, without shooting your blood sugar levels. Try this healthy yet yummy whole wheat spinach pancake with a scrumptious filling of cheese and mushrooms. A healthy breakfast recipe that is packed with essential nutrition, without compromising on the taste quotient. You can even pack these yummy delights in lunch box for your kids, as they are rich in iron and protein. You can pair your spinach pancakes with hummus or yogurt-based sauce and fresh tomato salad. Raise your hand if you are done with your scrambled eggs! This healthy breakfast egg recipe can easily be a part of your diabetic-friendly breakfast meal. If the findings of a study, published in 'The American Journal of Clinical Nutrition', are to be believed, then eating four eggs a week may help you manage Type-2 diabetes. So treat yourself with this delicious yet healthy breakfast recipe, without any second thoughts. Kick-start your day on a healthy note with these healthy diabetic-friendly recipes; but before adding any food to your diet, do consult your dietician or diabetologist.